One of the more feisty Celtic bands around. Presented as a 4 piece band they are highly suited to festivals, conference after dinner entertainment, pubs and clubs, corporate and outdoor events or private functions. The very talented quartet John, Justin, Maurice and Jane bring you some of the best live entertainment you're ever likely to see. Blending traditional Irish instrumentation with contemporary songs, this talented quartet bring something quite unique and very special to the New Zealand music scene. You may have seen them on TV ONE's Good Morning show! As well as reconstructing traditional Irish/Celtic tunes that have been around for generations, Shenanigans also enjoy taking well known contemporary classics and Irishing them up, which makes for a very entertaining experience. Audiences are encouraged to get involved in the performance with plenty of crowd participation. Where else would you hear the likes of the Muppet Show and Monty Python used whenever a string is broken in a live performance? These four fine musicians blend the haunting sounds of Celtic whistles and mandolins with lush keyboard backing, soaring vocals and solid drumming to drag your guests on to the dance floor. Their musical careers span many moons over many countries and the amalgamation results in a feisty collection of songs to keep you entertained for hours. 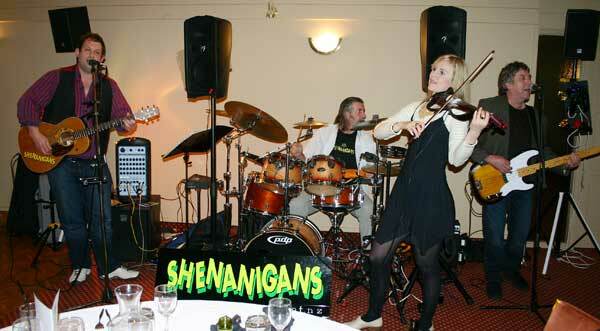 Don't wait until St Patrick's Day to book this band. They're great fun at any time of year.